Some of the most common errors I have seen teaching algebra occur because students simply cannot accurately “translate” words into mathematical models, or because they do not understand math “jargon” such as evaluate or simplify. I think this problem could easily be avoided, however, if one or two days were spent focusing on these skills. We cannot expect students to walk into class with a clear understanding of “math words” if they were never explicitly taught. Math is a language we must teach students, just as Spanish or French must be taught and learned. No one would expect a student to walk into Spanish 1 already knowing how to translate English phrases or sentences into Spanish! 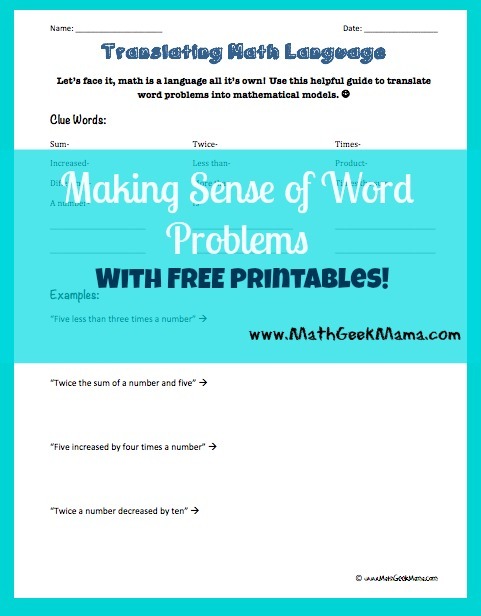 Below are some helpful handouts I have used to give my students a chance to think about words or phrases that have specific meanings in Algebra, as well as a review of “math words” that they need to understand before they can correctly answer a math problem. Ultimately, the goal in Algebra is to be able to problem solve by writing a mathematical model to represent a real life situation. Call them what you will, “word problems”, “story problems”, “application problems”, but the bottom line is this: how to work through solving these types of problems must be taught. And so I hope the following resources are helpful to you and your students!